Sweden’s Johan Kristoffersson took a lights-to-flag victory on home soil at this weekend’s Swecon World RX of Sweden, round seven of the FIA World Rallycross Championship presented by Monster Energy. Kristoffersson’s win in the PSRX Volkswagen Sweden Polo extends the Swede’s lead on the overall leaderboard – he is now 31 points clear of team-mate Petter Solberg who has moved up to second. EKS driver Mattias Ekstrom was forced to miss Holjes RX due to DTM commitments and has consequently dropped to third in the points. Norwegian Andreas Bakkerud put on another strong showing in his Hoonigan Racing Division prepared Ford Focus RS RX Supercar to finish runner-up, while nine-time WRC Champion and Team Peugeot-Hansen driver, Sebastien Loeb, completed the podium line-up. 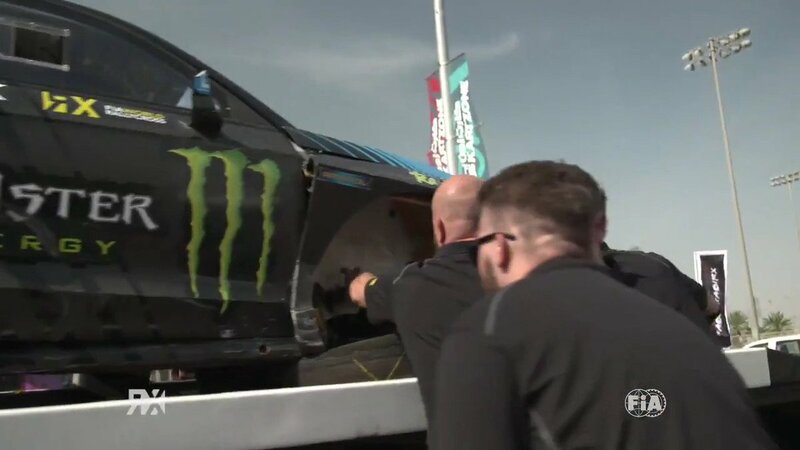 Two-time World RX Champion Solberg stalled his car at the start of his semi-final. Eager to make up time lost on the first lap, the Norwegian lost further time on lap three when he went off-track when challenging MJP Racing Team Austria’s Timo Scheider. Solberg finished the weekend seventh overall, while Scheider placed tenth. Loeb’s team-mate Timmy Hansen brought the squad’s second Peugeot 208 WRX Supercar home in fourth place making Team Peugeot-Hansen the biggest point-scorers in the Teams’ Championship this weekend. Meanwhile, Sweden’s Kevin Eriksson put on a fantastic display in his MJP Racing Team Austria prepared Ford Fiesta Supercar to make it three Swedes in the top five. The 20-year-old also won the coveted Monster Energy Super Charge Award after clocking the fastest reaction time at the start of today’s final. Latvia’s Janis Baumanis – who drives for STARD – posted his best result of the year so far after finishing sixth overall in the Austrian-team’s Ford Fiesta. His team-mate Timur Timerzyanov finished 11th in similar car. GRX driver Niclas Gronholm also had an impressive weekend, the Finn achieving his best result this season with a strong run to eighth place. The third round of the FIA European Rallycross Championship presented by Monster Energy (Euro RX) once again saw plenty of action as a packed entry of Supercars battled it out in the highly-competitive category. It was Anton Marklund who eventually triumphed in the Volkswagen Polo, making it another Swede to win on home soil and in front of a record crowd of 45,100 people. Peter Hedstrom took the runner-up spot while accomplished WTCC driver Rene Muennich rounded out the podium in his best ever rallycross finish. Marklund continues to top the Euro RX leaderboard – he is now 19 points clear of Robin Larsson who retired from semi-final two. In the fourth round of the RX2 International Series presented by Cooper Tires, Great Britain’s Dan Rooke took his first victory and ended series leader Cyril Raymond’s winning streak. “This is the moment I have been waiting for – my first international victory,” beamed 20-year-old Rooke, the reigning MSA British Rallycross Champion. Belgium’s Guillaume De-Ridder and Swedish teenager William Nilsson completed the RX2 podium in Holjes. In the overall standings, Raymond leads Rooke by six points. In the FIA European Rallycross Championship for Super1600, where Sweden marked the third round, it was a Skoda Fabia podium lock-out. Latvia’s Artis Baumanis took the win and has snatched top spot on the leaderboard with a total of 75 points. Hungary’s Krisztian Szabo (the defending champion) and Estonia’s Janno Ligur were second and third respectively in similar cars. “CSUCSU” #10, disqualified from Q1 for causing a collision and forcing another driver off the track. Joni-Pekka Rajala #60, loss of ten championship points for use of a third turbocharger in the Competition. Timo Scheider #44, five-second penalty in Q4 for causing an avoidable collision. Henning Solberg #73, restricted access to practice (maximum four laps) for being late to initial scrutineering. Philip Gehrman #39, restricted access to practice (maximum four laps) for being late to initial scrutineering. Peter Hedstrom #8, €200 fine in Q1 because one tyre was missing a barcode. Derek Tohill #111, five-second penalty in Q3 for causing a collision at the exit of the Joker Lap. Jerome Grosset-Janin #74, five second penaltyin Q4 for leaving the track and gaining a place on rejoining. Anton Marklund #92, reprimand for causing a collision. Kasparas Navickas #6, five-second penalty in semi-final two for causing an avoidable collision. Jussi-Petteri Leppihalme #11, five-second in the final penalty for causing a collision and gaining a place. Stein Fredrik Akre #98, five-second penalty in Q2 for causing an avoidable collision.